Come to peace and ambiance just 4 minutes from KeriKeri Township. This charming fully self-contained 3 bedroom holiday cottage is situated on a very private 1 and a half acres surrounded by a spray free citrus orchard and fruit trees. This is a 3 bedroom cottage opening onto a fully shaded veranda with BBQ and outdoor settings. This property is fully fenced and well maintained and cared for with professional cleaning between guests. All linen and towels supplied. Sitting on your shaded veranda, you will enjoy relaxing BBQ overlooking our orchard and palm trees. Visit neighbouring highly acclaimed Marsden and Ake Ake vineyard and restaurants. Easy access to boat ramps and sightseeing of Bay of Islands. Pick your own citrus fruit to freshly squeezed each day or have your catch of the day smoked in owners smoke house. Your hosts, Steve and Laurel, can organise sightseeing or fishing trips on their 24ft Boston Whaler Boat (P.O.A). In winter enjoy the comfort of a wood burning fire or the pot belly stove located on the front veranda while downing a warm brandy. This property and location will not disappoint any family looking for a relaxing private holiday in the world famous KeriKeri and Bay of Islands. Laurel & Steve purchased this property in 2011 and have invested in many plants to make this a unique garden and orchard for guests to wander through. Enjoy relaxing on seats and benches located throughout the grounds. 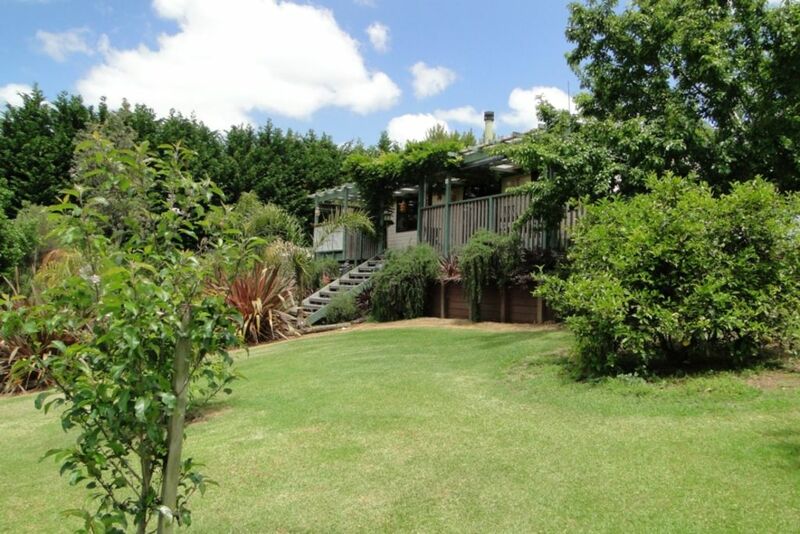 Location to KeriKeri and surrounding Wineries, restaurants and local tourist attractions. This property has easy access for parking boats. Really nice place in a beautiful citrus grove. Even more peaceful than we expected! Thanks a lot for having us. A lovely base for a Northland holiday. We had a lovely stay in this beautiful, restful property. The home was warm, neat and clean, fully furnished with everything we needed, and the grounds were absolutely beautiful. This property was close to Kerikeri for shopping and enjoying historical sites, and provided a perfect base for exploring Northland. Thank you for making our restful Northland holiday so enjoyable. only one issue.We had observed a rat frequenting the compost bin in the garden.The same made a brief foray into the kitchen when the door was left open but hurried out as soon as approached. Really beautiful spot. Huge garden that is lined with fruiting trees which we were free to eat! Nice place with everything you need. We had 4adults and a 4 year old and didn’t feel squashed. Great deck out the back where we ate our meals and a nice bbq made things easy too. 5mins drive out if Kerikeri so handy access there. Would definitely recommend. Rainbow falls, tandem sky diving KeriKeri airport, Matakana chocolate factory, Historic Saturday markets, Rewa’s Maori village, Kemp House and gardens in Historic Stone Store Basin, walking trails.